1 of the businessmen (pastor) at my formal business center (church) called to advise me since over A-year I left them and followed NNAMDI KANU's teachings, BUT "SURPRISE SURPRISE" this businesses man(pastor) left the advise & started cautioning me about NNAMDI KANU and Biafra issues! #iLaughed ::::::"
He said,"their lord (Jesus)did many miracles. (7)he died and resurrected, that I should come back to him (Jesus) that my life will change again KWA, so I quickly told him that "am now a child of G-D, not that time we were in Business center (church)., so I went ahead to ask him questions based on what he listed that Jesus did. (1) all that Jesus did, was it magic or miracles? (2) where you there when Jesus did those miracles? (3) How come you believed all that since you were not there? He went into state of confusion by saying (Jesus) says: we should believe on all he did since the spirit (faith) is in us i SMILED and said to the business man (pastor)..... But why is't that when it comes to Prophet, savior, the only whiter than white and whiter than snow servant of CHIUKWU OKIKE ABIAMAH NNAMDI KANU's case you people would try hiding the truth? 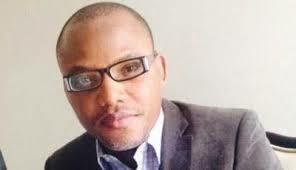 (4) Did you know that KANU has gone to land of death alive and comes back alive victoriously? (5) did you know that KANU has disciples more than Jesus? (6) Did you know that I have not seen KANU in person but I believed in his words by faith just that same faith you had in Jesus? (7) Did you know that KANU has performed miracles by uniting the people of S/E together? (9) Why do you hate KANU & his followers? (10) Who said in the bible that HE came for criminals, poor and hopeless people? (11) Was many of Jesus followers not ordinary people like fishermen and also criminals before they were charmed? He said " NO" that Jesus did not charm his followers to follow him that they received anointing from holy spirit.....#hahahahahahaahahahaha, "I then tell him that I HAVE EQUALLY RECEIVED my own anointing from holy spirit to follow PROPHET KANU, I added! At least NNAMDI KANU is still alive and am also alive and am witnessing his ministerial work while he is still alive, at least am seeing my Savior with my two eyes before following him but YOU never heard Jesus voice before following him....laughter!